Combine breadcrumbs and pepper in a shallow dish; dredge chicken in breadcrumb mixture. Add chicken to pan; cook 3 minutes on each side or until done. Remove from pan; keep warm. Add wine, broth, juice, and butter to pan, scraping pan to loosen browned bits. Stir in broccoli rabe; cover and cook 3 minutes or until broccoli rabe is tender. Stir in parsley and capers. 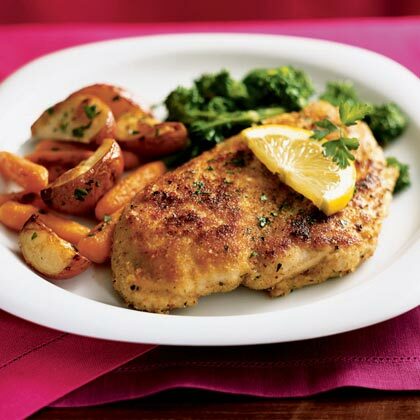 Serve chicken over broccoli rabe mixture. Garnish with lemon slices, if desired.